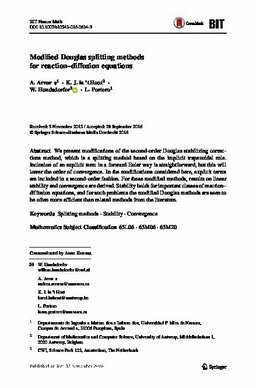 We present modifications of the second-order Douglas stabilizing corrections method, which is a splitting method based on the implicit trapezoidal rule. Inclusion of an explicit term in a forward Euler way is straightforward, but this will lower the order of convergence. In the modifications considered here, explicit terms are included in a second-order fashion. For these modified methods, results on linear stability and convergence are derived. Stability holds for important classes of reaction–diffusion equations, and for such problems the modified Douglas methods are seen to be often more efficient than related methods from the literature.